WASHINGTON, DC (MWA) Feb. 11, 2010—Muslimah Writers Alliance (MWA) urges the Muslim community to join Director, Aishah Schwartz in wearing purple on Purple Hijab Day (Feb. 13). The event, sponsored by Baitul Salaam Network, Inc., a national, non-profit domestic violence awareness organization based in Stone Mountain, Georgia and co-founded by Hadayai Majeed, aims to unite the Muslim community in speaking out against domestic abuse. Focal to the timing of this year's event is the tragic February 12, 2009 beheading of Aasiya Zubair Hassan, 37, at the hands of her husband, Muzzammil S. "Mo" Hassan, 44, in the Village of Orchard Park, New York. Aasiya's alleged crime? Seeking her legal and religiously mandated right to be divorced from an incompatible spouse. "It is of the utmost importance that the Muslim community continues to advocate in supporting victims of domestic violence, and seeking an end to violence of any form against women in any circumstance, particularly when it is alleged to be perpetrated in the name of Islam–as many have been led to believe–in the case of Aasiya Zubair Hassan," stated Schwartz. 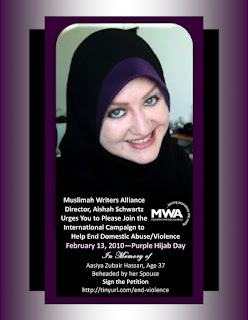 In addition to MWA, Purple Hijab Day is supported by a host of national and internationally-based organizations and activists, including: the Rhode Island Healthy Families Initiative; the Peaceful Families Project of VA; Muslim Men Against Domestic Violence-Atlanta, GA; Masjid Al-Islam of East Atlanta; HARIM, a Muslim women's artists and writers collaborative, and more. We must also strive to support our advocacy with education. There are people out there, such as the likes of Facebook personality 'Calif Namazifard', who, on January 23, 2010 posted a topic on "The Largest Islamic Group on Facebook" page, titled "US Courts Discriminate Against Muslims!" - the purpose of which was to bring attention to the "plight" of Muzzammil S. "Mo" Hassan, 44, who, Namazifard stated, "acted as any respectable Muslim would do [who's wife sought to divorce him] and cut her head off - Allah Akbar!" The post goes on to urge readers to write to the Governor of New York requesting that Aasiya's murderer be pardoned! This message was circulated within a 660,000+ members group. This is the kind of post 9/11 rhetoric that fuels the islamophobic atmosphere the Muslim community finds itself up against today —rhetoric that must be eradicated! Violence committed against women in the name of Islam, at the hands of men blinded by the kind of self-empowering, false doctrine supported by extremist teaching, such as that propagated by Namazifard, is inherently wrong - and its perpetrators must not be supported in their belief that they are above the law. In a statement released after Hassan's arrest, the Islamic Society of North America (ISNA), through Vice-President Imam Mohamed Hagmagid Ali stated, "Our community needs to take a strong stand against abusive spouses [and] we should support people who work against domestic violence in our community. We must make it a priority to teach our young men in the community what it means to be a good husband; the husband is not one who [threatens], harms or jeopardizes the safety of his family." "It's horrifying to think that a dispute with one's spouse could lead to violence, and disheartening to know it happens in the Muslim community. Insha'Allah, I intend to wear a purple hijab on the 13th in memory of Aasiya Zubair Hassan," stated MWA member Isahah Janette Grant, author of the children's story "Sameerah's Hijab and the First Day of School". "It is incumbent upon us as a faith community to stand up for what is right and to promote healthy marriages and peaceful family environments," Schwartz added. You can participate in the campaign to bring awareness to ending domestic violence by wearing purple on Feb. 13—whether it is a purple hijab, a purple ribbon pinned to your clothing, a purple bow in your hair, or purple shoes on your feet! Get in the spirit and spread the word about this important event, insha'Allah! Faith Trust Institute and the Peaceful Families Project has produced a DVD in which many scholars come together to address the of domestic violence. To learn more please visit www.faithinstitute.org or www.peacefulfamilies.org. 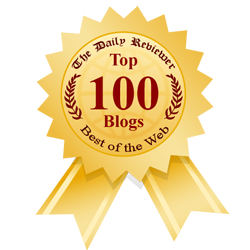 Established in 2006, MWA is an internationally-based organization with a Mission to inspire Muslim women to collaborate with one another for the sake of Allah subhanahu wa ta'ala and the common good of the Muslim Ummah, in addition to supporting one another in fulfilling their aspirations to become established writers. Islamic principles, boundless enthusiasm, experience and resourcefulness to every project embraced, MWA members are dedicated to one another's success. Purple Hijab Day Organizer Baitulsalaam—Please Support Generously! Can You Help Me Say, 'Somebody Stop this Man?"